You can remove client node from a clustered cache using the following steps. 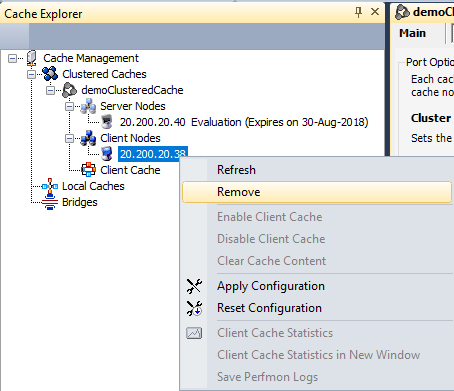 From the Cache Explorer window, right click on the client node under the cache name. Select Remove from the right click context menu. Click yes on the confirmation window and the client node will be removed. You might get prompted with a dialog box upon these changes, asking whether to reload or overwrite the cache config file. For more detail maintaining data integrity, refer to this chapter. Remove-ClientNode cmdlet enables the users to remove Client(s) node from the existing clustered cache(s) or on a specified server. The following command removes Client node 20.200.21.12 from a cache named demoClusteredCache.